Let’s not pretend our eyes didn’t meet. I saw the look you gave me. I saw you turn around. I saw your gaze travel from my head to my toes and then lock with mine. I saw you turn away, your lips pursed in purposeful silence. You saw me, and you saw that I saw the way you looked at me. Let’s not look away from that moment in polite, disdainful silence. I’m white, too — so maybe you expect me to say that I get it. I don’t. I understand white people who want to support racial equality and fail, because too often I am one of those white people. I don’t exempt myself from the category of white people who need to do better. I get white people who need to do better. But I don’t get you. I don’t get the white people who don’t even want to try. I don’t get the callous indifference in your ice-blue eyes. I don’t get how a white person could come to Union Park and hear children from the south and west sides of Chicago speak to a largely white crowd, rallied by the deaths of white children, and still be unable to say the words “Black Lives Matter.” I don’t get how a white person could listen to those brave and passionate children ask “Where have all of you been?” and not feel the same shame that I felt. I have no good answer for them. Maybe you do, but I doubt it. I suspect you would remain silent and look away again. The very least that you and I can do is stop looking away. We both came to March for Our Lives. But whose lives were you marching for? Who gets to be included in that “our”? Your silence is your answer. I’ve lived a pretty charmed and privileged life in a lot of ways. I’d heard the phrase “white silence is violence,” and I thought I understood it. I didn’t feel it until you met my gaze. That’s a white naïveté, too, and I know that my privilege has shielded me from that knowledge. I’m sure what I felt then is a negligible fraction of what people of color in this country deal with. But I wish I had a picture of your face in that moment. I would put it in the dictionary next to that phrase. I have to admit, it shook me. I was naïve enough to think that the people who showed up to that march would be sympathetic to all victims of gun violence. I know there are so-called liberals out there who aren’t, but I didn’t expect to see you here. Not at this march. Not in Chicago. I should have known better — I should have known that if you would be anywhere, you would be in Chicago. You may be the only one I caught giving me that look, but I sure noticed that one chant had a curiously difficult time catching on in our pallid section of the crowd. “This is what democracy looks like!” No problem. “Vote them out!” With gusto! “Black lives matter!” UhhhHHhHHhHh I mean, I guess so? We have to do better. Not just “we” like all of us, Americans, the human race, citizens of earth. “We” like you and like me. White people. It is unacceptable to pick and choose which children deserve protection from gun violence based on their skin color. It is unacceptable to simply fall silent when it has become a regular occurrence in this country for black people to be executed by police officers and pretend that silence is neutral. And I should not need to be the one to tell you that. Listen to the black youth who have been protesting gun violence for years and never gotten the public support that the white Parkland students have. Listen to the black Parkland students, too. Listen when black journalists point out that mass shootings have increased at historically black colleges and universities this year. Listen to the news stories about the high-profile shooting of Stephon Clark in his grandmother’s backyard and the serial bombings of black people in their own homes in the week leading up to the March for Our Lives. I need to do a better job at listening, too, by the way. I’ve said racially insensitive things before that make me cringe now, and I will likely make more mistakes in the future. Maybe I’ll find some in this very blog post. If I seem angry and sanctimonious, it’s only because I’m so frustrated that I can’t reach you. I wish that we had exchanged more than a brief glance. I’m still dissecting that look more than a week later. Were you surprised to turn around and see a white person join the “Black Lives Matter” chant? There was something that passed in that look, white person to white person, that I was meant to understand. Betrayal? Disappointment? Now is not the time to use that? Whatever passed in those two seconds, you made a determination about the words I was saying, about me as a person, and dismissed both. It would be easier to dismiss you, too, but I can’t. 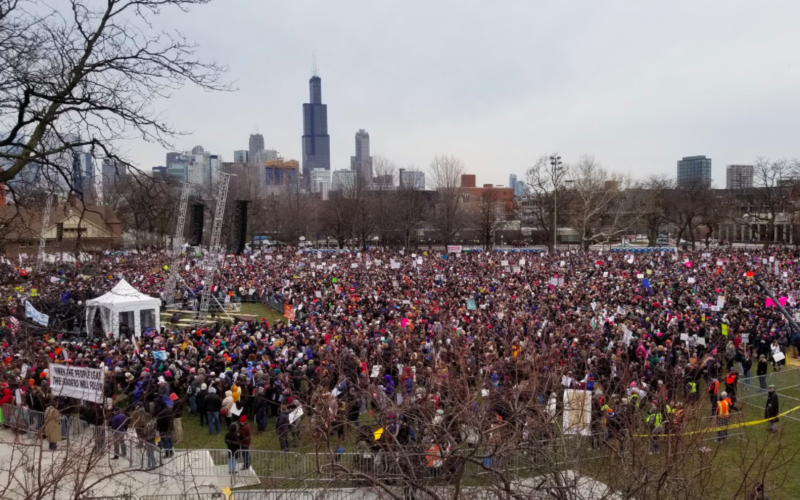 You, the woman I locked eyes with at the Chicago March for Our Lives, will not read this. But then again, maybe you will. You’re not just one individual. You are the 53% of white women who voted for Trump. You’re the mother who screams and claws your way to every single PTA meeting when your white child’s grades are threatened, but turns your back when a black child’s life is threatened. That’s not a stance. That’s not protecting children. That’s just me and mine. And I don’t know what to do about it, but I better figure it out. As upset as your indifference makes me, I need to find a way to have a real, genuine conversation with you and make you feel compassion for the kids that you and I have both chosen not to see for way too long. And I need for both of us to turn that theoretical compassion into action. Just as these Parkland kids have made me ashamed of how little we’ve done as adults, these south and west side kids have made me ashamed of how little we’ve done as white people. If white folks like us can’t even say “Black Lives Matter,” unequivocally, without shame or awkwardness, then we’re worse off than I thought. I haven’t painted a very flattering picture of you, huh? Maybe I’ve misunderstood. I hope you’ll prove me wrong. I hope that when our eyes met, you saw that it’s possible — even necessary — for white people to say that Black Lives Matter, too. I hope, if nothing else, it made you think. Because I want to see you at the next protest. I want those children from the south and west sides to see both of us at the next protest. I want those black kids to be able to walk to school safely just as much as I want angry white kids to stop shooting up their predominantly white classmates. I want them to stop having to ask where we were. I want to walk the walk that I’m talking, here, and part of that means getting you on board. A better world is possible for all kids. But you have to want it.